This entire post is a spoiler; do not read it. The week before last, my son, James, played in the Green Division Championship for QuizBusters. He was one of four players competing for East Lansing High School, the #1 seed in the tournament, and their opponents were from Hartland High School, which was (unsurprisingly) the #2 seed. It definitely looked like this would be the strongest team they had faced yet, and this turned out to be true. In the initial, ‘Quick 10‘, round of the game, it looked like East Lansing could be on their way to another rout, taking nine of the ten questions and jumping to a 90-10 lead right away. However, that was misleading, as Hartland started a comeback with the ‘Toss Up‘ questions, during which James answered a tough question (“The 16th Amendment”) but his team uncharacteristically failed to get the first bonus question (about The Will Rogers Follies on Broadway), earning only 10 of a possible 50 points. After the first ‘Pop Quiz‘ round, the score was tied at 170, and we were getting nervous. Fortunately, East Lansing finally hit their stride and managed to earn some sweeps, taking the next 170 points to double Hartland’s score, and from there the game never got close again. East Lansing won the Championship by a final score of 540-290, which was the closest game all season. In fact, East Lansing did not have twice Hartland’s final score, and this was the only QB game this season where they did not at least triple the opponent. The victory came complete with $5000 scholarship offers from Michigan State University, where James has already been accepted. Nice. 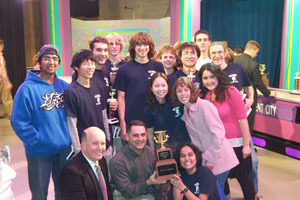 This past week, East Lansing faced the White Division Champions, Kent City, in the QuizBusters Grand Championship. Watching the weekly games on television, it is clear that the Green Division teams, from the bigger schools, tend to be better than the White Division teams. This game played out to form, and it really was not much of a game, East Lansing winning 530-90. However, they did complete one of their side goals for the season, sweeping all ten of the ‘Quick 10’ questions (to take an initial 100-0 lead). Of course, winning the game also added a one year book scholarship for each player, so that will help James even more. For those interested in watching the games, the Division Quarterfinals, versus Okemos, will be aired on April 1st (no fooling), the Division Semifinals, versus Howell, will air on April 29th, the Green Division Championship will show May 13th, and finally, the Grand Championship will be shown on May 20th. All of the games are (reputedly) viewable online after they air on WKAR, and the web site also lists the full broadcast schedule for all games. The varsity QuizBusters team before the Division Championship. The East Lansing team celebrates the Grand Championship.